The home of the Minnesota Vikings will be this year’s host for Super Bowl LII. While the team and fan base have to be disappointed in coming up just one game short of being in the championship game, they should be proud of their new stadium. Why? It offsets 100 percent of its electricity with renewable energy credits and uses a number of energy-efficient technologies. In fact, it's LEED-Gold Certified. As a cool aesthetic touch, the stadium's massive windows and ETFE roof (ethlyene-tetra-fluoro-ethylene) provides amazing views of Minneapolis and gives it the feel of still playing outside without the cold weather. Not only is this the first time ETFE has been used on such a major scale, but a signature design is the Legacy Gate, which has five of the world’s largest glass doors that are from 75 to 95 feet tall. By allowing so much light into the stadium, and with the majority of NFL games played during the day, this cuts out the need for so much artificial lighting. 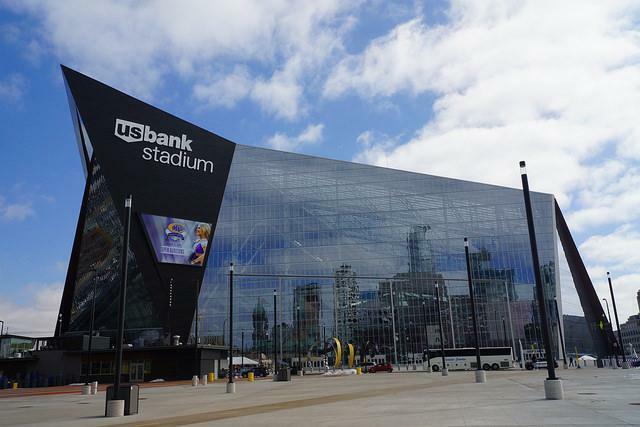 How is the US Bank Stadium actually offsetting its energy use? 40 percent of the roof that uses zinc cladding provides additional heat in the winter or cooling relief in the summer, and it’s durable enough to withstand harsh winters. Compared to the old Metrodome, US Bank Stadium uses 16 percent less energy and 26 percent less lighting. The latter was achieved by using LED lighting that can turn on and off quickly and can change color. This is handy during pregame or halftime entertainment, or when a different event is happening inside the stadium. US Bank Stadium is partnering with the NFL during the Super Bowl to recover more than 90 percent of stadium waste that will be generated on Sunday. Called "Rush2Recycle," this effort hopes to sort recyclables from standard trash, compost food service ware, and will encourage those at the stadium to recycle or compost their garbage. It’s a great day for #Vikings football! Double tap if we’ll see you at #USBankStadium today. The ability to fully offset its energy use and to provide a focus on limiting traffic in downtown Minneapolis has given US Bank Stadium an LEED Gold certification. HKS also has sustainable features in another new stadium they built for the University of North Texas, Apogee Stadium. It has an LEED Platinum Certification with water-efficient plumbing, high-efficiency systems, and three 150-feet tall wind turbines that pushes energy into North Texas’ power grid. With new stadiums cropping up every few years, it initially feels like a waste to demolish old structures that are only decades old. However, new buildings that feature sustainable practices and push for LEED certifications are greater for the environment than older stadiums and can actually save organizations money in the long run.